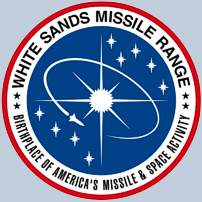 The White Sands Missile Range ( formerly White Sands Proving Grounds ) was established in February of 1945 for the purpose of developing and testing military weapons, mainly missiles and bombs. On July 16, 1945, at 5:29 a.m., a 13 pound plutonium bomb was detonated at the Trinity test site. The nuclear explosion, although small by modern standards, turned sand into trinitite, shattered windows 120 miles away, and created a shallow 1082 foot wide crater. Later that month, 300 railroad cars of captured German V2 rocket components arrived for assembly and testing. The combination of these two technologies led to the first ICBMs. By the 1990's White Sands had more than 1,500 precisely surveyed instrumentation sites using 1,000 optical and electronic tracking and telemetry systems. The White Sands Range has an area of about 3,200 square miles ( 8,300 km 2 ) and is the largest military installation in the United States. White Sands has also had UFO sightings by trained military personnel. During a skyhook balloon launch at about 10:20 AM on April 24, 1949, engineer Charles B. Moore was using a theodolite to observe a small pre-flight test balloon when a UFO suddenly entered his field of view. According to all observers, the bright white UFO demonstrated speed and maneuverability beyond any technology at the time. Another high-profile sighting took place around 3:00AM on November 3rd, 1957. Two MPs watched a bright red-orange oblate spheroid ( egg shaped ) UFO descend toward a bunker. At an altitude of about 50 yards it suddenly vanished, but re-appeared a few minutes later and continued to descend on an angle. Then once again, it suddenly dissappeared. The MPs described the descent as a controlled landing but a subsequent search yeilded no trace of an object. The UFO was estimated to have been 75-100 yards in diameter.